Knowing what ADS are working for other people or companies is critical for your success. On average, Facebook is home to 1.45 billion daily active users -- from CEOs, to students, to companies. And while the community is clearly there, connecting with them from a marketing standpoint isn't always easy. For brands, posting on Facebook alone isn't enough anymore -- especially for ones just starting out. Sure, you can throw money at your efforts to drive people to your Facebook Page and send them to your website, but that only works if you're smart about it. One way to do just that is to create optimized Facebook Ads targeted at the right audience. Optimized ads can help you spend your PPC budget wisely and see a positive return on your investment. Get the ebook on which rules of digital advertising were myths all along. Relevance is critical for success when using Facebook advertising. Remember, you are spending money when someone views or clicks on your ad (depending on the settings you use). If you're showing ads that aren't relevant to your target audience, you're wasting your time and money and will likely not see success with any kind of advertising. Back in February 2015, Facebook launched a feature in the Facebook advertising platform that rates your ads and gives you a relevance score, similar to Ad Rank in Google AdWords. The more relevant your ad image, ad copy, and destination page is to your audience, the higher your score is -- and the more favorably Facebook will treat your ads. 3. It includes an enticing value proposition. Your value proposition should be believable. For example, saying you have the greatest sandwiches in the world will not make people come to your business's Page, but maybe offering 20% off will. Or, perhaps adding social proof will help -- something like, "Sandwiches loved by over one million people every year! Come try yours today and get 20% off your order with this coupon." 4. It has a clear call-to-action. A beautiful and relevant ad is great, but without a call-to-action (CTA), your viewer might not know what to do next. Add a CTA like “Buy now and save X%,” or “Offer ends soon” and add a sense of urgency to your viewer. Your CTA should encourage people to click on your ad now. This type of ad is the most traditional on Facebook, it appears on the right side of a user's Facebook News Feed. This is the first type of advertising Facebook had, and it still exists today. Although ads in the News Feed are likely to get higher engagement metrics due to its native advertising features, right column ads shouldn't be forgotten. We often see less expensive clicks and conversions when using these ads. In order for a right column ad to be successful, it needs to be relevant, have a value proposition, a good visual, and have a call-to-action. This type of ad appears directly in a user's News Feed when they access Facebook on a desktop computer, and it looks more like native advertising. In our experience, these ads have a higher engagement rate than right column ads, but they can also be more expensive. 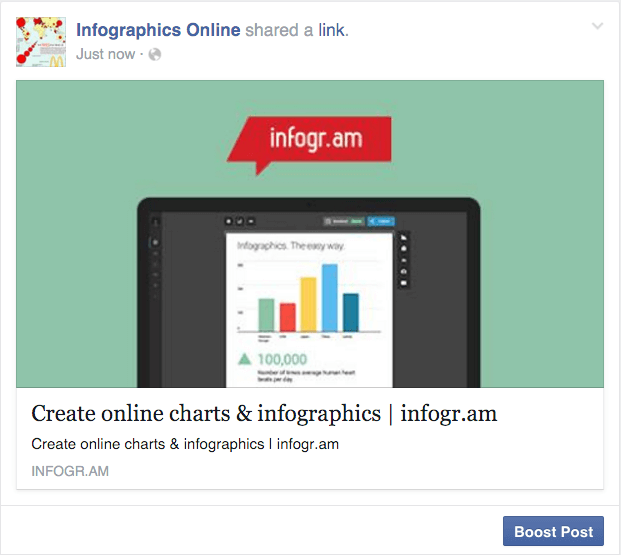 These ads must follow organic Facebook posts best practices and be both engaging and visual. Like the desktop News Feed ad, this type of ad appears in the user's mobile News Feed and displays like an organic post from the people and Pages they follow. Video ads appear fairly large in the user's New Feed and offer more engaging content than static posts. And with 8 billion videos being watched on Facebook every day, it serves as an interesting -- and potentially profitable -- ad type for marketers to try out. How can you create your own video ad? First, understand Facebook video ad requirements including length and video size. We suggest keeping your video as short as possible, even though Facebook allows you to upload a much larger video. Create a video that displays your product or service, and upload directly to the Facebook ads manager by following these instructions. Another type of rich media advertising on Facebook is a post of an image. This is one of the most popular types of ads ever since Facebook began favoring visual content. 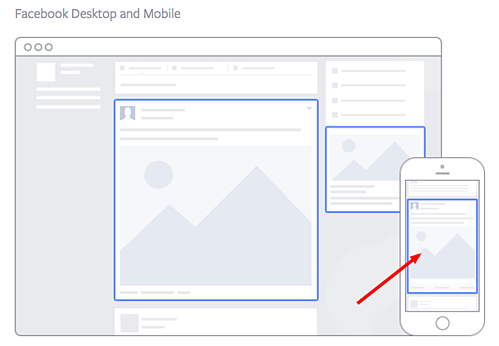 The optimal size for News Feed photo ads is 1200x628 pixels, otherwise your image will get cropped. Adjust your image based on the target audience's needs and by what will appeal to them the most. 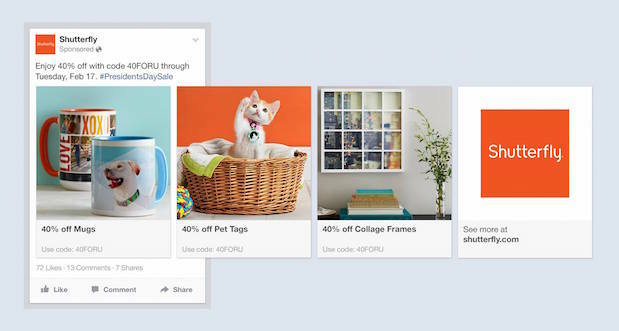 Multi-product ads allow advertisers to showcase multiple products within one ad. Viewers can scroll through the images and click on individual links to each product. You can promote multiple of anything, not just products -- like different blog posts, ebooks, or webinars. These ads can be created in the Facebook Power Editor. 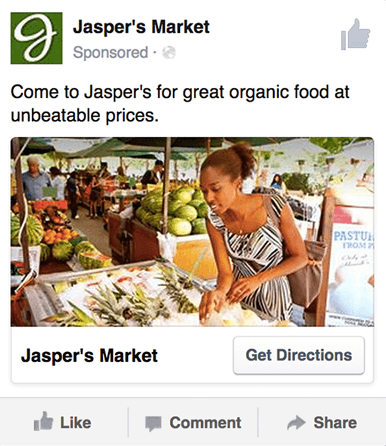 Reach ads on Facebook are designed for to grow your local awareness. They only work if your business has a physical location to which you're trying to drive real foot traffic. If you fall into this category, locally targeted Facebook ads might be a great fit for you, as you can hyper-target on Facebook down to the mile. 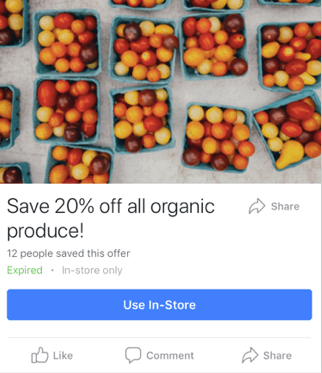 If your business has an offer or event going on at your store, set up a few Facebook Reach ads that appear only to people within a short distance of your store. Have these ads appear a few days prior to the event and on mobile devices while the event is happening. 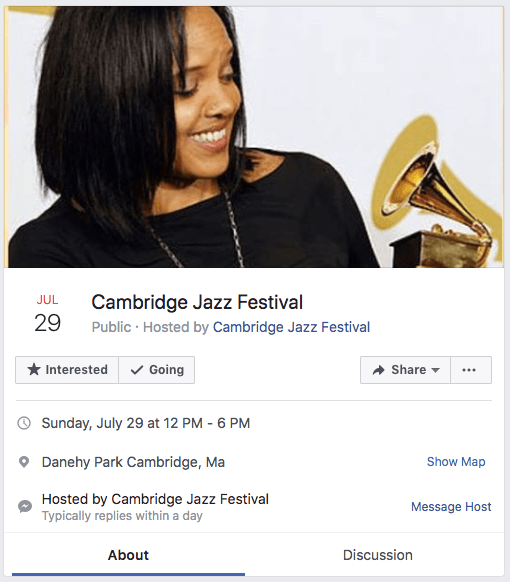 You may want to reach some people the day of the event who happen to be in the area and checking their Facebook account on their smartphones. An offer ad is a form of Facebook advertising wherein a business can promote a discount on a product or service that can be redeemed on Facebook. The benefit of this? It eliminates one step in the buyer's journey, which ultimately increases sales. The offer ad has many benefits. First, it drives the user directly to the offer. The user claims it directly on Facebook, removing any added friction of needing to go to your website for the offer. You also can reach any type of audience that you want, as all the Facebook targeting options are possible. Finally, you can include all the information needed for the user to decide if they want it or not, including the time period it is usable, the number of people who has already claimed it, and the exact amount the offer is. This will eliminate any unqualified clicks, which cost you money. Event ads promote a specific event. The CTA on these ads usually send users directly to the ticket purchase page, wherever that happens to be hosted. Using this type of ad will help drive a targeted group of people to attend your event. These will show up in the News Feed of the specific audience you've chosen. Events are a big part of most businesses, but getting people to attend even a small event, can be tricky. Promoting your event to a targeted specific audience on Facebook can help drive the right kind of attendees. A good ad in this format will clearly show the benefit of attending the event: the price, dates, and a clear CTA to purchase a ticket. A boosted post is an organic Facebook post that was originally on the homepage of a company's Facebook, and that later was boosted with advertising money. This is different from the above ads because it's not created in the Facebook Ads Manager. You can include more in the description, as there is no limit to word count on boosted posts like there is in ads. You can also have a link in the copy. The cons? Boosted posts leave you fewer options for bidding, targeting, and pricing. You also cannot run any types of A/B tests because you're promoting a post that has already been created; you're not creating one from scratch. A retargeting ad promotes an ad to a specific list of previously identified people. Have you ever seen ads follow you across the internet after visiting a certain website? Then you've seen a retargeting ad. 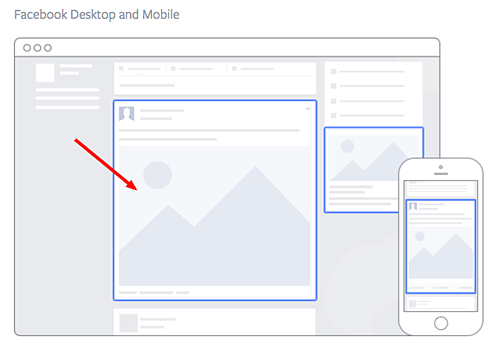 Now that we've covered the main ad best practices, formats, and templates, let's dig into a sampling of the best Facebook ads that embrace the above guidelines. This Facebook video ad from Kay Jewelers tells a quick but moving story -- something Kay Jewelers is well-known for -- using just a few seconds of your time. You don't even need the sound on in the video above to know what's happening and the message Kay is sending. If you're advertising a product with sentimental value, like Kay Jewelers, video ads are the way to go. Just be sure your video has a clear (and happy) ending -- people view videos more passively on Facebook than they would on YouTube, and don't have time to interpret your ad if it's too long or complex. It's visual. Even though this is a video, I have a general idea of what I will be watching, thanks to the screen capture it started with. Additionally, I can understand the gist of this ad without playing with the sound on, which is important given that 85% of videos on Facebook are now viewed without sound. It's relevant. It's relevant to me because I was recently scouring jewelry websites, specifically for necklaces like the one in the ad. It's valuable. Kay shows potential customers the value of purchasing with the help of the happy reaction from the woman receiving the gift in the ad. Plus, who doesn't love dogs? It has a solid call-to-action. This ad is set up to drive Page Likes, which is an easy, one-click way for me to get more relevant content served up to me. Monday.com is a task-management tool that caters to multiple operating systems, both desktop and mobile. But in the photo ad above, the company used its compatibility with Mac computers to remix its own logo in the original rainbow colors of the Apple brand. For growing businesses like Monday.com, it's a smart idea to pivot off the brand awareness of household names. 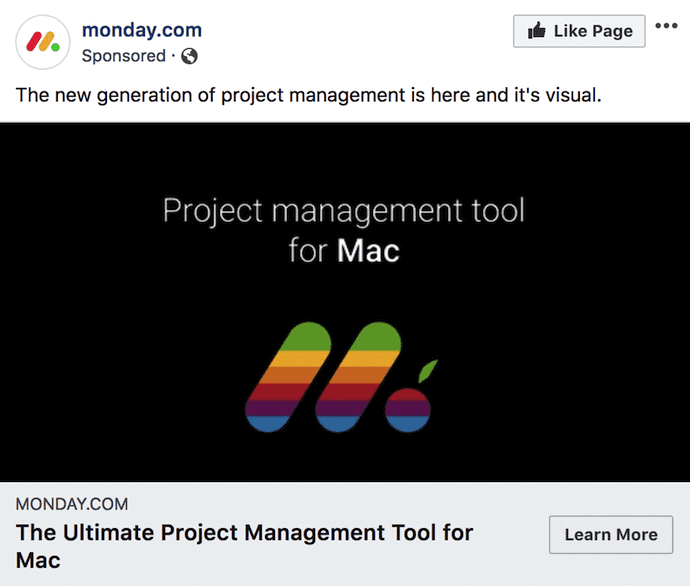 By filling the Monday logo with Apple's famous rainbow color-way, the ad above captures the attention of Mac users who'd recognize those vintage rainbow stripes anywhere (and could use a new task-management tool that works on their computer). It's visual. The rainbow colors filling the Monday logo are both eye-catching against the black background and familiar to any Mac user. It's relevant. For Mac users, and those who need to organize their tasks on a regular basis, this ad is relevant to their lifestyle in more ways than one. It's valuable. The ad calls attention to Monday's compatibility with Mac computers, making the product's user experience more valuable to Mac users as a result. It has a clear call-to-action. The "Learn More" CTA on the bottom-right of the ad is a clear invitation to find out more about this product's usage on Apple hardware. This is how an event ad from Amazon looks in the News Feed on a desktop. This ad works well on a few different levels: A sample product is clearly displayed, the ad shows an impressive (but honest) rating of that product, and you know which event Amazon is promoting right away -- Black Friday. 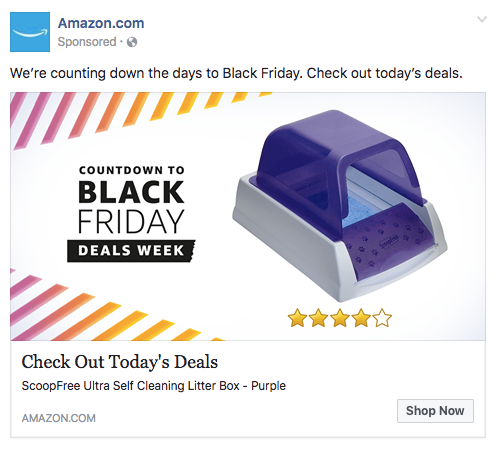 Ecommerce companies like Amazon use event ads to boost sales at specific points during the year, and Facebook event ads make this easy. When investing in event advertising, build a list of the holidays, shows, conferences, and awareness months your business cares about. That way, you know exactly which marketing campaigns line up with these occurrences and when to promote it on your Facebook Business Page. It's visual. Not only is this image larger than the right column ad display, but it also uses warm colors, white space, and directional lines, which drew my eye towards the featured product. It's relevant. As a cat mom, this offer is clearly tailored to my consumer needs. It has a clear call-to-action. Amazon instructs me to click on its ad today, after which point the deal for the litter box will presumably disappear. "Now" is strong CTA language that compels clicks. This photo ad by NatureBox features a creative point-of-view shot that is perfect for the angle at which you'd dive into the company's various health snacks. The ad makes you imagine your next house party ... I thought the peanuts spilling out onto the table was a nice touch. In your next Facebook photo ad, play around with live-action photography and digital design in the same image. 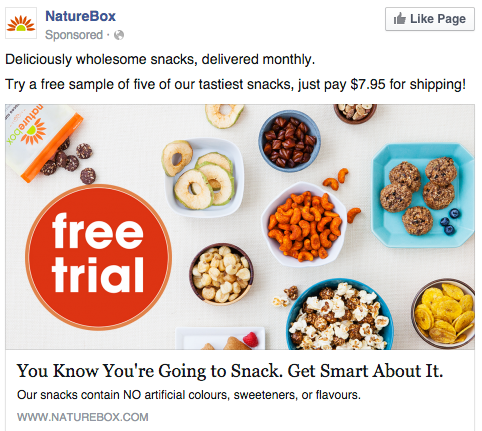 As you can see in the ad above, NatureBox was able to design a vibrant "free trial" icon right on top of an image that would've worked just as well on its own. It's visual. The image shows you exactly what you're getting, and it calls out the “free trial” CTA well. It's relevant. Everyone likes to snack. In all seriousness, the person who saw this is a fan of several lifestyle subscription companies, which is what NatureBox is. It's valuable. This ad is full of value. First, the “free trial” callout is the first thing your eyes go to when looking at the image. Second, it clearly mentions the healthy aspects of the goodies in its product. It has a clear call-to-action. NatureBox is asking you to try its free sample. It couldn't be easier to know your next step. 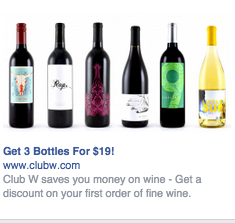 Here's an example of a short and sweet (literally) retargeting ad from Winc (formerly known as Club W). This ad is displayed on the right column of Facebook specifically for users who browse wine-related content online. When your ad caters to people who you know would be interested, modeling the product the way Winc does above can be a home run for your brand. It's visual. The visual is clear, simple, and appealing to all types of wine-lovers. It's relevant. This came up in my wine-obsessed colleague's News Feed. Need I say more? Two thumbs up on relevance. It includes an enticing value prop. Three bottles for $19? What a steal. They also pull the viewer in with an additional value: a discount on their first order of wine. It has a strong call-to-action. The word "get" is strong call-to-action language, and it's used twice here. A time limit on this offer would have made it even stronger. Here's an example of a multi-product ad from Shutterfly, along with the additional images that are used in the ad. Each image has a different offer, to appeal to many different demographics in one ad. 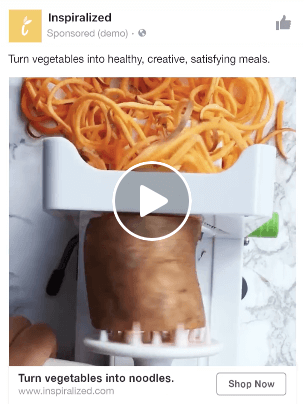 In each image, the product being promoted is consistent in the look and feel of the Shutterfly brand -- this an important quality of ads that showcase more than one item and picture. It's relevant. The person who saw this loves taking photos and creating sentimental gifts. Spot on, right? It's valuable. There is a very clear value for the user, 40% off each of the products being advertised. The code and sale end date are also clear in the ad description. This ad also has an added level of value, it is showing the many different ways people can use Shutterfly, in ways many may not be aware of. It has a clear call-to-action. I know I need to use this before February 17th when this deal expires, so I would be encouraged to take action right away. 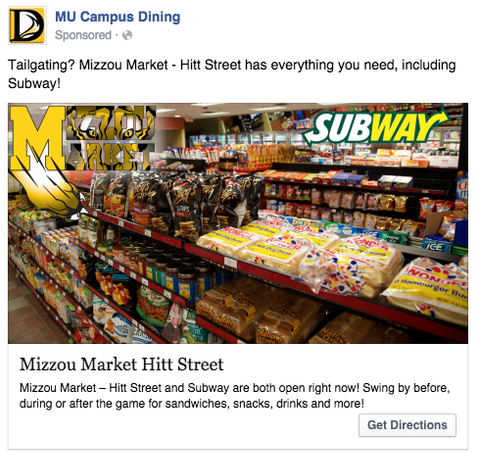 This Facebook reach ad from Mizzou Campus Dining promotes amenities at the University of Missouri, using two familiar logos and a marketplace that anyone on campus might recognize. The ad copy beneath the image invites customers in "after the game" -- a reference to campus life that helps Facebook users imagine when they might want to stop in for a sandwich. It's visual. This image has college pride, a variety of salty and sweet treats, and a well-known logo to attract hungry college students. It's relevant. This ad is likely only being shown to students on campus who are in its target audience. It also mentions the sports game that was going on at the time, and plays to the student's current needs: snacks and Subway sandwiches. It's valuable. Mizzou Market is telling hungry college students that it has everything students need for the big game. It has a clear call-to-action. This ad has the option to show directions, making it extremely easy for a college student on the go to follow the walking directions to this market. All consumers really need to see is the boxer pictured above to know what this ad by Boston Sports Clubs (BSC) is offering. The woman in the photo even looks like she's staring at the text to her left, getting viewers to shift their attention to the promotion right away. This Facebook offer ad makes it obvious what customers would be signing up for when they click the "Sign Up" CTA button below the picture. Offer ads can easily mislead viewers into pressing their CTA just to get them to click on it, but it ultimately doesn't convert viewers into customers. BSC's approach above is clear and upfront about what it's offering throughout its conversion path. It's visual. The featured photo uses bold colors and clear typography to draw my attention to the details of the offer, and the woman exercising gives me an idea of what I could gain from purchasing the offer. It's relevant. 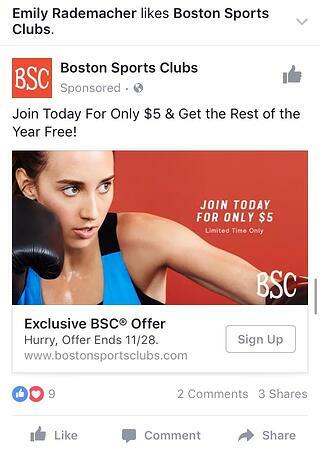 I recently moved to Boston and have been searching for gyms in my area online, so this ad is highly relevant to my recent Facebook and search activity. It's valuable. Paying $5 for a monthly gym membership is a great deal. Even though the price may increase in the future, the low price definitely makes me want to click. It has a clear call-to-action. The CTA emphasizes that the discount offer is limited and should be claimed quickly using the word "hurry" and telling me when the offer expires. This video ad by Allbirds, a shoe maker, uses simplicity and whitespace to its advantage. The video only lasts nine seconds, but Allbirds demonstrates the product in a way that catches your attention and resonates with the individual wearer. There's a lot of ad content on Facebook, and when Facebook users scroll through their News Feeds, that content start to blend together. Sometimes your best chance at sticking out on Facebook is by using subtle movements and details -- like Allbirds did, above. Let every other video on Facebook be quick and flashy, and yours will be a breath of fresh air to your audience. It's visual. The video has a clear focus on a subject, and that subject is engaging in a movement that means something: These shoes are comfy. I subconsciously started wiggling my own toes as I saw this ad for the first time. It's relevant. I'm always interested in finding new shoes -- I probably search or click on something related to footwear once a week. This ad feeds that interest in a unique way. It's valuable. The opening quote above the video is reason enough for me to want to learn more about why these shoes are so comfortable. Allbirds also sweetens the deal with "free shipping," "free returns," and a note below the video that the product is "machine washable" -- all without taking the focus away from the video itself. It has a clear call-to-action. If I want these shoes, there's a "Shop Now" CTA button to the bottom-right of the ad, waiting for me take a closer look at them. This photo ad by the The New York Times is driving traffic to a written article with an intriguing illustration. The drawing literally depicts the article's ideal audience -- millennials. For young readers who are even a little interested in health and fitness, this cartoon (along with the enticing headline) pokes just enough fun at them to get their attention. 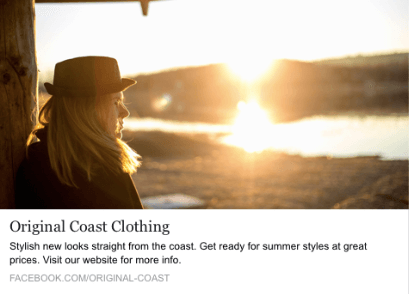 When publishers advertise on Facebook, they need to be especially creative with their featured images -- if their main product is a reading experience, the photo they choose has to complement their written content perfectly. The New York Times' ad above is an example of photo ads done right. It's visual. The quirky cartoon drew my eye as I scrolled on my mobile News Feed through lots of text and photography. The nontraditional illustration pulled me in for a closer look at the content. It's relevant. I'm a person in my 20s, and I used to write about health care. 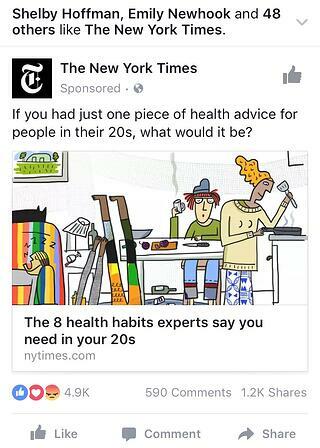 This is an article I would definitely be interested in reading, and it helps that the ad appears like a native post promoting an article in my New Feed. It includes an enticing value prop. The ad shows me which of my Facebook friends also like, and presumably read, The New York Times. This social proof makes me more likely to click and read the article. It has a clear call-to-action. This ad is dedicated to increasing the page's Likes, and by asking a question in the ad, the call-to-action makes me want to click the article to learn more. Successful event ads have at least two important qualities: the event's schedule and something to justify why people should attend. The event ad above for the Tortuga Music Festival accomplishes both of those things -- it displays the date and time and the bands playing, and shows you a picture of the amazing time you'll have if you come. It's relevant. 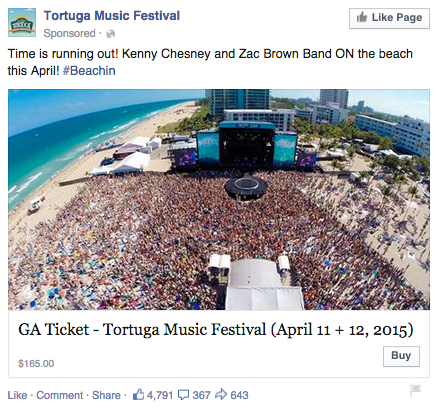 The person who saw this ad is a fan of Kenny Chesney and has been to his concerts before. They're also originally from Florida, which is where this event takes place. It has a clear call-to-action. The CTA is clear: "Buy." The advertisers also add urgent wording with the title “Time is running out!”, encouraging you to purchase your ticket now before it's too late. Last week, I started shopping around for a bridesmaid dress for an upcoming wedding I'll be in. Today, the ad above appeared in my News Feed. Retargeting ads enable you to get in front of those viewers who are already looking for what you're offering. 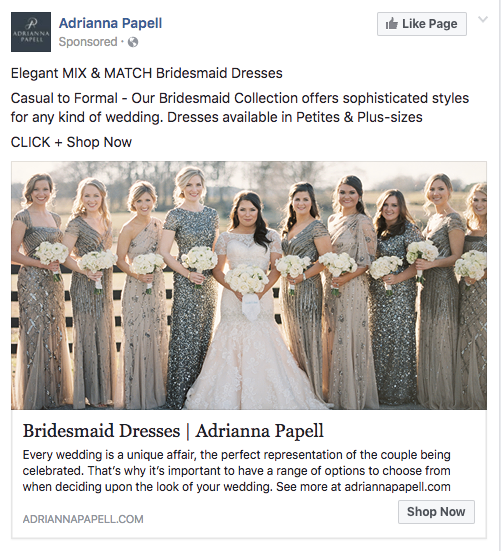 This retargeting ad by Adrianna Papell doesn't just show me what I'm on the market for -- it excites me about how beautiful our own wedding party pictures will look on my friend's big day. It's visual. The image gives me a good idea of what to expect from the designer's website, and it definitely helps that the gowns are both unique and stunning. Talk about a showstopper. It's relevant. The ad called out that I was already shopping for bridesmaid dresses, and what's more, I had previously looked at dresses on this exact website, so this ad is highly relevant to my search. It's valuable. The variety of dresses in the ad's image and in the description make this website worth a visit for someone trying to find the perfect gown out of thousands of options. It has a clear call-to-action. The CTA is "Shop Now," which encourages me to click to purchase the beautiful dresses in the ad's image. Here's an example of a boosted post from Bustle, who promoted one of its articles on Facebook. Paying to "boost" a post you already posted organically to your Facebook Business Page can greatly benefit content that has mass appeal -- versus a post that targets a specific segment of your audience. Bustle's choice of boosted post here falls into that first category. 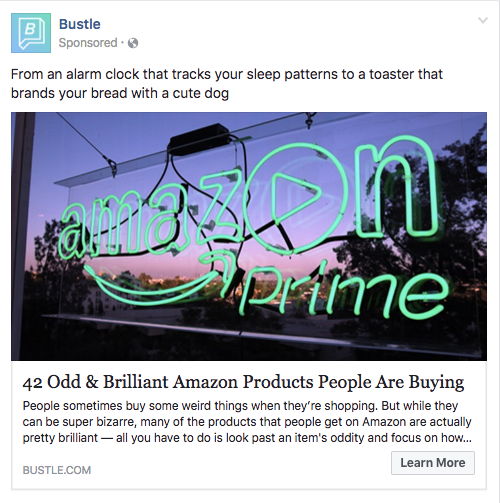 From Amazon's vibrant neon sign in the photo, to the high number of examples included in the article (42, to be exact), Bustle's boosted ad is sure to pique the interest of many Amazon and Bustle followers. It's visual. Lots of people are familiar with the Amazon Prime logo, but not in neon lights in a window display. It made me do a double-take while scrolling through Facebook. It's relevant. As we've already learned from earlier examples, I like shopping on Amazon and also read Bustle, so this article is a combination of those two behaviors. It's valuable. "Brilliant" is a strong adjective to describe products, which makes me curious to learn more about purchasing them. It has a clear call-to-action. The ad entices me with information about useful and "brilliant" gadgets I can get delivered to my door within two days, which I'm happy to click to learn more about. There you have it: A list of all the different types of Facebook posts and a few examples of awesome ones from all different brands. 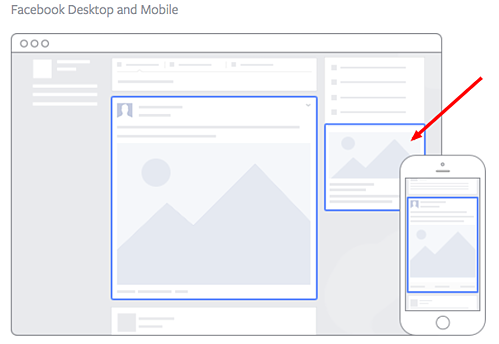 The Facebook Ads Manager platform will walk you through how to set these up with simple, step-by-step instructions -- so don't feel overwhelmed. Or, watch this short video for tips on creating and optimizing Facebook ads. ← 5 Things You Need To Master Emotional Intelligence in Marketing!